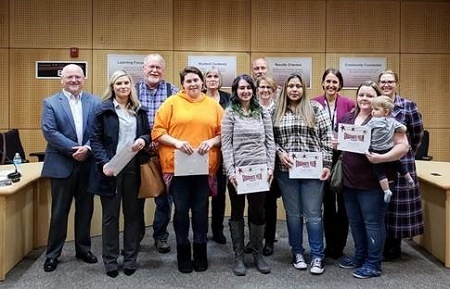 The Yelm Community Schools Board of Directors on Nov. 20, 2018, presented 10 community members with the YCS Graduate Yelm Award. The individuals below earned their high school diplomas through the High School 21+ Program held at Yelm Extension School. The program is taught by Annamary Fitzgerald, SPSCC faculty member and former Yelm High School graduate. The HS21+ Program is a collaboration between South Puget Sound Community College, Yelm Community Schools, Yelm Timberland Library, and the South Sound YMCA.